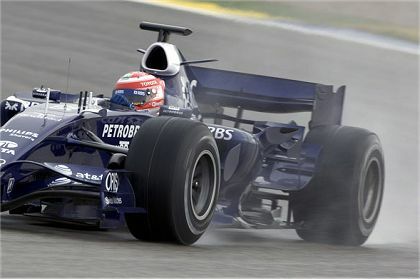 Williams has announced that their drivers for 2008 will be Nico Rosberg and Kazuki Nakajima. That seems a very sensible arrangement to me, putting an end to the speculation that Rosberg would go to McLaren and allowing the Williams team to get on with preparations for the new season uninterrupted by silly questions from a press desperate for more rumors. Some drivers seem to fit with certain teams better than others; Senna was one who looked right in a McLaren but somehow out of place in a Williams, but with Nico's father, Keke, the reverse was true. And I think the son looks at home in a Williams too - even the idea of him in a McLaren feels strange to me. So I am happy that my prediction that he would stay has turned out to be correct. I think we will see a fruitful partnership between the young Finn and his natural team in the years to come. It also seems right that Nakajima has been given his chance in the second car. He did well in Brazil, in spite of his much-publicized accident with a couple of the mechanics, and has a year of assisting the team in testing behind him. Williams know what they are getting, therefore, and will no doubt provide him with a little more practice in pit stops before the first GP of the season. In fact, Nakajima is one of those drivers I have a feeling about. In an interview today, he mentioned that he wanted to become Japan's best F1 driver to date. That is not an unreachable goal - although there have been some pretty good Japanese drivers in F1, none have really broken through to the extent of competing with the best. Sooner or later it will happen, however, and Nakajima has the potential to be the one who makes it. He is fast and reliable, as demonstrated in GP2, where he had a string of podium finishes this year. I have watched him in a couple of GP2 races and there is something about him that seems right. While others were getting over-excited and falling off the road, Kazuki pressed on at speed, looking confident and capable. He did not win a race but was always near the front. Add to that the fact that he now has a GP completed (something other Japanese drivers have struggled with in the past) and things begin to look good for him. Perhaps the best thing he has going for him is the lack of expectation from onlookers. Being teamed with one of the best of F1's new stars will mean that no-one will be surprised if he does not begin by beating his team mate. We will be quite happy if he does a competent job, qualifying well enough to support Rosberg and then racing to a respectable finish in each GP. It may not sound like much, but Alex Wurz found it too difficult and plenty of others have fallen at this first hurdle. I have long contended it takes 3 to 5 years to "mature" a rookie into a reliable F1 driver. Examples: Kova a year testing and a year on the grid, Kubica, a year and a half and he's not yet caught Heidfeld, and many others who got dropped just as they were starting to produce, Pizzonia , Klien, and now Luizzi. It took Rosberg two years to finally produce points, Can Williams really waste another 2 years training Naga-what-ever? A roll of the dice at best. Well, Nakajima has had a year of testing with Williams which is some experience at least. No doubt he'll make plenty of mistakes in the coming year but, as you say, it's all part of the training necessary to become a Formula 1 driver. I would guess that Williams are expecting Rosberg to really start paying off in 2008 and so they can afford to start building the next one. Unfortunately GP2 is only aired at the wee dark hours pre pre F1 everything so I've only caught a handful of bits of races, and honestly it was just a blur over the steam from my coffee cup. I'll take this as it's written and keep an eye. For an entry level though, right now if anyone can give him as good a footing as possible, it would be williams. To Number38, I agree, it takes about 3 years for a real Championship talent to mature, they're still capable of scoring points, etc during the learning curve. And. on reflection, going by your theory sort of damns F1 to the motorsport doldrums. We've just traded Schumacher, a really interesting and complex racer for Hamilton. Talented and I have no doubt quite capable of getting a handle on the new specs but, sort of a drink of water so far. Considering we were all afraid to speak our fears prior to this season and all but pronounce Williams the next team to be factory boys, I'd say they're putting up a fair fight. They can afford this time and if this kid has the affiliations associated with the name, here's to hoping they get a hefty cash injection and a solid driver who's on the learning curve.